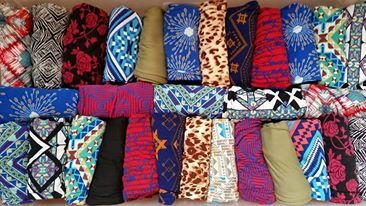 So, some of you may have already heard of LuLaRoe Leggings. I had a few friends that had them- they’re recognizable mainly by their super fun (okay, sometimes a little crazy) designs. I hadn’t tried them because leggings aren’t usually a go-to for me because I need thicker fabric (okay, because I’m fat). However, when Cassie asked me to try a pair for a giveaway, I figured I could always wear them around the house. You guys, these leggings feel like a kitten and the Snuggle fabric softener bear had a magical baby. I’m not even kidding. They are like a hug for your legs. LuLaRoe leggings come in two sizes, “one size” and “tall and curvy”. I’m on the edge of “One Size” so I decided to go with “tall and curvy” and the first thing I did after realizing they were amazing was to put them on my mom. She’s 6’2 and normally things that are “tall” look like she’s getting ready to go wade in a creek, if you know what I’m saying. As you can see- they go all the way to my mom’s ankles! Love it! However they knit these, they seem to stretch and conform really easily to any body type, because they fit her 6’2 size 12 body and they fit my 5’7 size 14, and we were both in love with them! The one unusual thing about LuLaRoe products is how you purchase them. Unlike most HBB’s where you order from a catalog, you’ll want to actually meet up with Cassie so you can purchase from a trunk show (or host one yourself). The patterns change constantly, and each print is a limited edition, so if you want it you need to snap it up! In addition to their prints, LuLaRoe also carries solids, and I can tell you right now there is nothing I’d rather wear under a dress or a long sweater than magical SnuggleKitten leggings. I host on-line sales so you get to shop from the comfort of your couch. It and my other sales are open only to the members of my Facebook group, or the members of a hostesses party – you’re not competing against the entire internet for that perfect look. i can hold the private hostess parties either online or in-home for you and a collection of good friends. As the host, you earn FREE clothes as your party finds outfits that let them show off their sense of comfy-style. My inventory is ALWAYS growing – I’ll have over 200 NEW items arriving in the coming days, and over 100 new pairs of leggings! Want to win a pair of magical Snuggle/Kitten LuLaRoes to wear yourself? 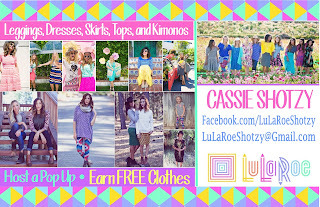 Enter using the rafflecopter below to win your choice from Cassie’s collection!